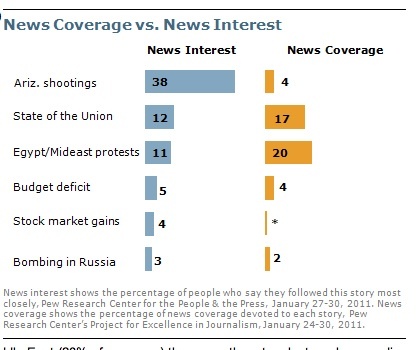 The Pew Research Center released a study today showing that while news organizations devoted 20% of their news coverage to the situation in Egypt last week that only corresponded with an 11% interest in the situation in Egypt by Americans. So, are Americans really that disinterested in what looks to be one of the largest revolutions in a long time? I know it is Super Bowl week. Does that have something to do with the lack of interest or are Americans just fulfilling the sterotypes about them that they are generally uninterested in the rest of the world, except how it will personally affect them? What about you? Have you been following the situation in Egypt? Have your friends? Why or why not?